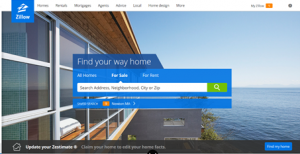 Zillow, a third party real estate site, has a search feature called Pre-Foreclosure listings. These listings are causing a great deal of frustration, confusion, and disappointment for both home buyers and real estate agents. 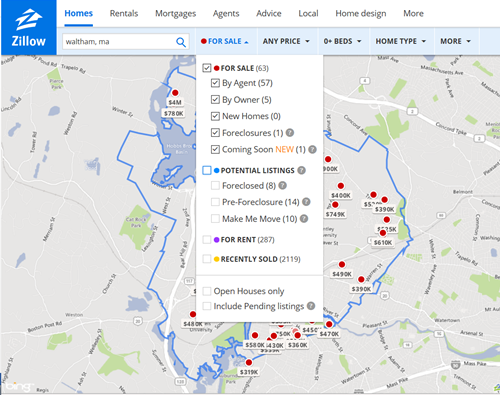 When a home buyer goes to Zillow’s home page search portal, they can click on the blue Potential Listings choice and in particular the Pre-Foreclosure option. The problem is the majority of these homes are not actually for sale and may never be for sale. Most Pre-Foreclosure homes are just properties where the lender has initiated foreclosure proceedings because the owners were behind in their mortgage payments. Some of these listings are foreclosed homes, but this doesn’t mean the home is for sale. If they were for sale, it would be a long time before they went on the market as the foreclosure process in Massachusetts typically takes over a year. The fact is the owners of these homes often aren’t even aware their home is being featured as one of Zillow’s Pre-Foreclosure listings. Once an official notice from a lender has been served to a homeowner, Zillow pulls the public record, posts a Google street view image of the home, the address, and some details about the property. The homeowner is not allowed to opt out of having their home publicly listed. Many home buyers assume since the Pre-Foreclosure homes are listed alongside traditional listings pulled from MLS that they must be for sale and available to see when neither is the case. Real estate agents are frustrated by Pre-Foreclosure listings as well. The current low inventory of homes has prompted home buyers to search for Pre-Foreclosure listings they think are for sale. Since so many listings show up in their search, buyers mistakenly believe these are also for sale. Many times when they contact their Buyer Agent to schedule a showing for these Pre-Foreclosure homes, they don’t believe when Agents say the homes are not for sale. We’ve received a lot of feedback from our Buyer Agents and also from Agents outside our company and they agree they are seeing this happen with buyers more and more. We advise home buyers that the best way to use Zillow is to select the red For Sale option when searching, this will only show homes that are actually for sale. They should not select the blue Pre-Foreclosure option when searching. If a home is for sale it will show up — even if it is a foreclosure — when you select the red For Sale option. This way you can be sure you are not missing out on any homes on the market. We pulled sample data on homes across the state to see which Pre-Foreclosure listings are actually for sale. As you can see, most of these listings are not for sale, are not listed on MLS and most likely will never go on the market. Homes in this list that actually are for sale will show up when you select the red For Sale option when searching on Zillow or in a direct MLS feed. The best way to avoid disappointment is to avoid searching Pre-Foreclosure listings altogether. That way you will not miss out on anything. To get the most up to date and accurate listings, buyers should use MLSPropertyFinder. Many home buyers don’t realize that third-party aggregator websites like Zillow and Trulia actually get their listings from many different sources, not always from a direct MLS feed like our MLSPropertyFinder. Because of this, these third party sites often have duplicate listings, out-of-date and even incorrect information. We see it all the time: a buyer wants to schedule a showing for a home listed on one of these sites and the home has already sold, is under contract, or was taken off the market. This causes frustration for the buyer who must now start their search all over again. Unlike third party sites, our MLSPropertyFinder gets updated listing information straight from MLS every 15 minutes, it will alert you to new homes as they become available on the market and it’s absolutely free. Our MLSPropertyFinder is the best product out there and that is why we offer it to our clients. If you are a home buyer and you are getting frustrated that you cannot find a home don’t be fooled into thinking that Zillow’s Pre-Foreclosure list has any additional homes that you can buy. Inventory is very low right now due to the market. Be patient because the right home will most likely come on the market in the coming months.